One of the chef’s challenges was having to cook with restricted ingredients. Despite not knowing what would be delivered, the results were beautiful. 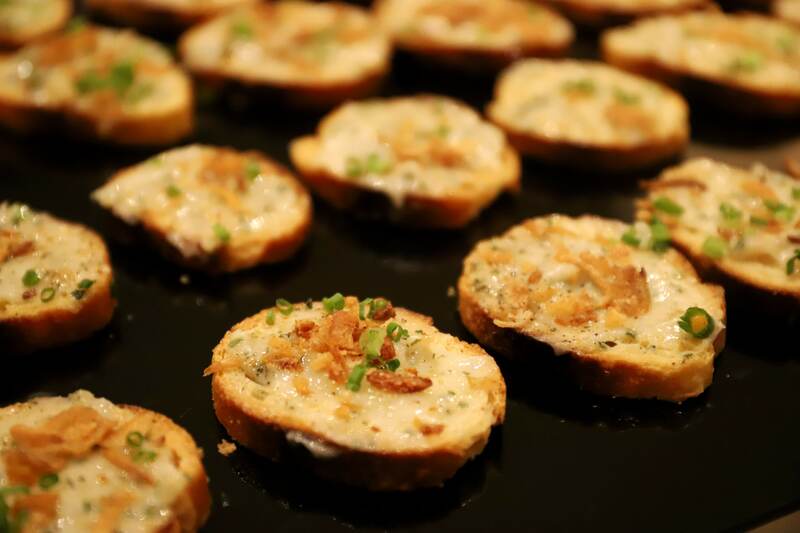 Imagine attending a workshop or a conference where a lunch buffet is served for the hundreds of participants. Have you ever wondered where all those delicious leftover dishes go after everyone leaves the dining room? Or how supermarkets manage expired merchandise? Whilst each hotel or supermarket has a different policy on dealing with food waste, some of it goes straight into the bin. Why is this alarming? According to the data from the Pollution Control Department, a Thai creates about 1.14 kg of waste per day. 64% (or 0.73 kg) of this is food or organic waste. In most cases, it will end up at landfills without proper waste management and eventually emit greenhouse gases into the atmosphere, with the effects later impacting humans and the environment. Food waste has many categories. It includes not only spoiled or leftover food that is not fit for human consumption, but also products which just exceeded the expiry date or with a less attractive appearance that might not meet the requirements of market standards despite still having nutritional value. Among that are fruits and vegetables with pale leaves, perhaps a little damage or just smaller than the standard size. All this food is far too good to be wasted so one group of people decided to ‘rescue’ it. The organization Scholars of Sustenance (SOS) collects excess food from hotels, restaurants and supermarkets every day and delivers it to those in need in Bangkok such as orphanage nurseries. Most of the time, these foodstuffs and ingredients are perfectly edible but just not desirable enough in the sense of marketeers. What’s the best way to assure them that this food is safe enough to eat and even very tasty? We let people try them. Organised as part of the 3R Forum (reduce, reuse, recycle), the “Too Good to Waste” pop-up event invited participants to taste finger food made from surplus ingredients in cooperation with GIZ, Marriott and SOS. Mr. Daniel Bucher, Senior Executive Sous Chef from Marriott Marquis Queen’s Park hotel brought his team to create various appetising dishes cooked from ‘kitchen waste’. This included parts of the food often not used for a conventional hotel menu and that are time-consuming to prepare and thus usually get thrown away. 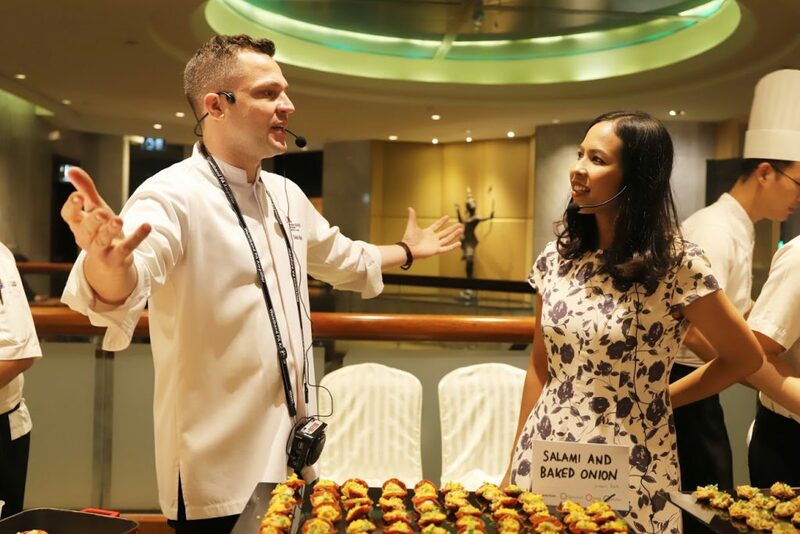 Chef Daniel Bucher gave his view on how every effort can contribute to reducing the impacts from food waste. “For our day-to-day operation, it is important for people working in the kitchens to know what can be used or thrown away so that they can think and act differently. Education is essential and powerful,” the chef told participants. 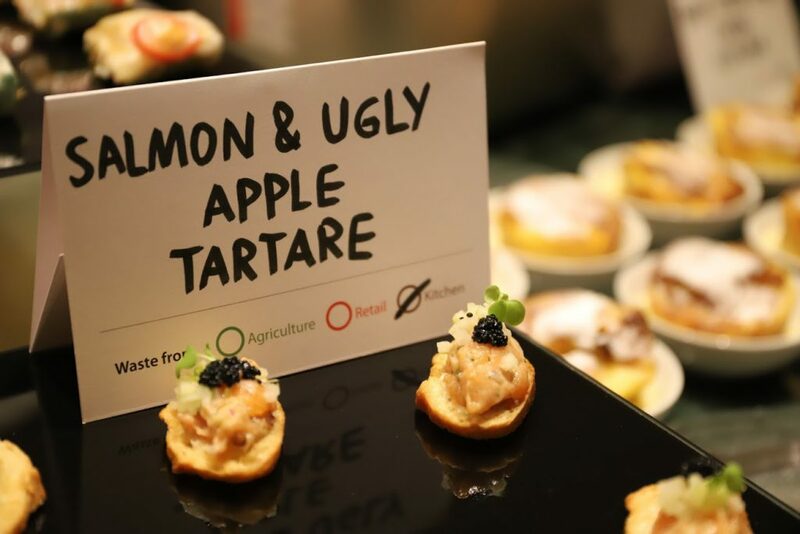 Marriott hotels measure and report food waste from their kitchen operations and these reports serve as evidence to show people how much food is lost during the process. 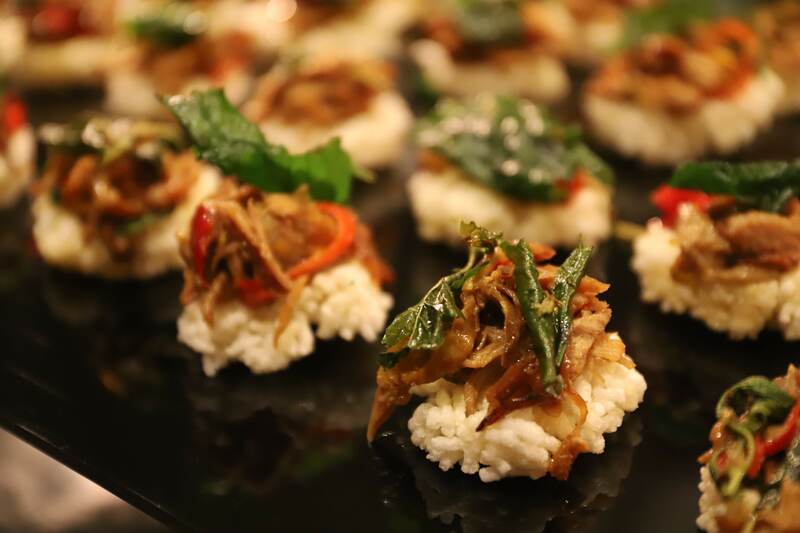 Overall, food waste at Marriot’s Goji Kitchen and Bar was slashed by 27.4 tonnes, or 20% per cover, over a three-month period from September to December 2018. The campaign has also offset 68.4 tonnes of CO2 emissions. “We acknowledge food waste as a massive global problem but there are too few facts and figures available to go forward with setting up regulations and standards. We need the correct data to understand this issue better” said Bucher when asked what he expects from the government in tackling food waste. Naturally, more actions are needed to create a more sustainable system for food waste management. What we can however do right now is to reduce food waste in the first place. 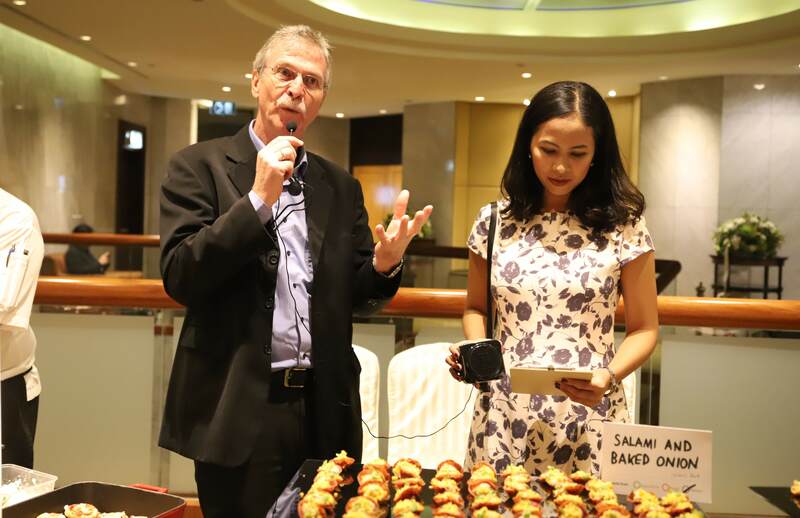 “We want you to have a look at the food in your hands now and be aware that these delicious ingredients which were originally perceived as waste,” said Mr. Werner Kossmann, Project Director of Thai-German Climate Programme – Waste at the event. “We hope after this event all of us will become a bit more aware of this perception and think twice before throwing edible food away.” Mr. Kossman added. The 9th Regional 3R Forum in Asia and the Pacific took place from 4th – 6th March 2019 at Royal Orchid Sheraton Hotel in Bangkok. The theme was “3R as a Way for Moving towards Sufficiency Economy Philosophy – Implications for SDGs”. The objective was to prevent and solve environmental problems following the 3Rs principle (Reduce, Reuse and Recycle). This includes identifying the policy, taking measures and the exchange of academic information, knowledge and experiences in 3Rs of various countries in the Asia-Pacific region. The event was co-organised by Thailand’s Ministry of Natural Resources and Environment (MoNRE), the Ministry of the Environment of the Government of Japan (MoEJ), and the United Nations Centre for Regional Development (UNCRD).